Cambridge, MA Addressing the shortage for emergency housing for families, the Cambridge Health and Human Services Department and HMFH Architects completed a new 10-unit emergency shelter residence within a now historically-preserved and sustainably-designed 19th Century building. The Cambridge Historical Commission honored the project and the city with a 2018 Cambridge Preservation Award. The 1885 period home once stood among a row of stately residences lining Mass. Ave. During recent decades, 859 Mass. Ave. was adapted to office use and over time fell into a state of neglect and disrepair. Faded aluminum siding, a gerrymandered front entranceway, rusting fire escapes, and paved-over gardens illustrated its long decline. The building’s interior was demolished down to the studs and structural beams, allowing the team to design ten family-sized shelter units. Designed to accommodate an adult and one or two children in need of temporary, supportive housing, the new spaces include private baths and shared kitchens with dining areas on each floor. The YWCA manages the residence under contract with the city of Cambridge. 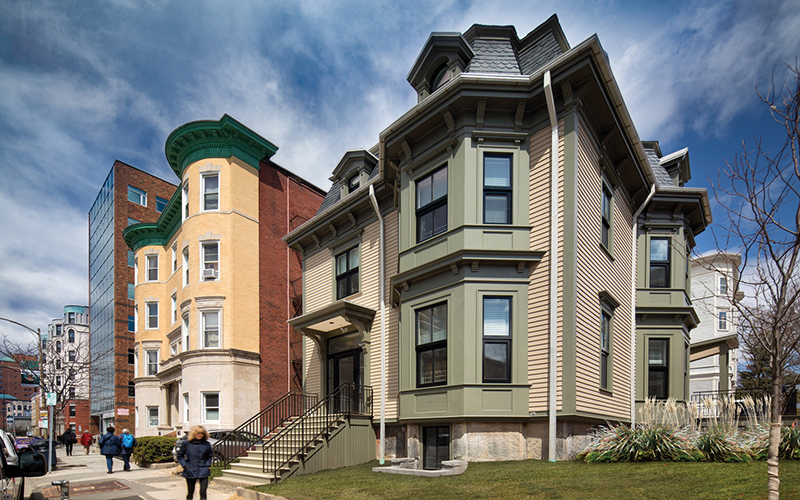 The design team worked with the Cambridge Historical Commission to document the building’s original features such as exterior siding, windows, and roof materials. Every exterior detail including trim, paint colors, and front stairway design was considered in making design and materials decisions to achieve a restoration true to the original appearance and neighborhood presence. Sustainable design was an equally important aspiration for the city and HMFH. This project is designed to meet the requirements of the city’s net-zero energy standards with the goal of reducing energy use to as close to zero as possible and producing enough renewable energy onsite to meet its own annual consumption. The newly-restored residence features three different kinds of solar panels, high-efficiency mechanical systems to lower heating and cooling utilization, and LED lighting with sensor technology. The thermally-resilient design was achieved by doubling the thickness of the exterior walls and insulation and specifying ultra-high efficiency windows and doors to significantly reduce energy use. “When the city purchased the property, we were fascinated with the opportunity to discover its past and develop a holistic design to restore the house and revive its original distinction in this neighborhood,” said Lori Cowles, project director and principal with HMFH. “The new residence at 859 Mass. Ave. provides a welcoming, comfortable environment for families and children in need,” said Ellen Semonoff, Cambridge’s assistant city manager for human services. “The beauty and functionality of the building let families know that they are valued members of our community. Achieving such a high level of sustainable design and returning the building to its true historic character are additional community benefits that the city, HMFH, and all our team participants can be proud of,” she said.